People in search of an authentic and traditional English pub experience manage to keep The Turf Tavern buzzing despite its almost secret location. Visit any day of the week and you'll find the Turf Tavern full of university students, academics, local families and visitors from all over the world in search of British TV icon Inspector Morse's favorite boozer. The fictional detective, created by Colin Dexter and featured on the long-running British television series, was only one of this pub's famous (if fictional) customers. Among the real live celebs: Elizabeth Taylor and Richard Burton were reputed to stop in while staying nearby; the cast and crew of the Harry Potter films hung out while shooting in Oxford; Stephen Hawking, Thomas Hardy, Emma Watson and Ernest Hemingway bent their elbows at this bar (not all at the same time). It's also alleged to be the place where, during their Oxford University days, former Australian PM Bob Hawke downed a yard of ale in 11 seconds --making the Guinness Book of Records--and President Bill Clinton, famously, didn't inhale. Christopher Middleton, writing in the Telegraph, said of this pub, "You could have been visiting Oxford for the past 600 years and still not found The Turf Tavern." That about says it. Finding this fascinating little pub with its very long history is something of a challenge. Turn down New College Lane, across from the Bodleian Library. Pass under Oxford's much-photographed Bridge of Sighs and almost immediately turn left into St. Helen's Passage, an alley so narrow you may not be able to spread both your arms. It used to be called Hell Passage. In Evelyn Waugh's Brideshead Revisited Charles says, "The Turf in Hell Passage knew us well." The passage widens and narrows as it turns corners. About 150 yards along--just as you think you are lost--the tiny Turf Tavern comes into view. Go straight ahead through a tiny, green door or follow meandering passages to the right and left into beer gardens. The Turf may not be Oxford's oldest pub but its ancient foundations support a warren of small, oddly shaped rooms, connected by narrow passages, small staircases, and two small, busy bars. An easier way--but so much less adventurous and not anywhere near as much fun--is to enter Bath Place, a cobbled pedestrian lane, off Holywell Street. The pub is about 300 feet along from this direction. Just how old the Turf Tavern is and whether it is the oldest pub in Oxford is also a bit of a mystery. Certainly, it is one of the oldest, competing with The Bear, a Fuller's pub that claims to be serving since 1242. The ramshackle, half-timbered facade that faces Bath Place is probably early 17th century. A sign on the side of the pub claims they've been serving since the 12th century (that would be the 1100s). But the earliest confirmed report of the place is 1381 in the tax records of the reign of King Richard II. Once you do find it, there is plenty to enjoy in its tiny, interconnected rooms. Despite being a managed pub (meaning it is run by a brewing company), the managers, Greene King, have maintained the character of a freehouse, offering a wide range of real ales and beers. Guest ales are kept on tap, with the selection changing daily. Wine is available by the glass and bottle and champagne by the bottle. Orange juice, soft drinks, and coffee are dispensed with as much good cheer as alcoholic beverages. And if they have time for a chat (which isn't often) the servers at a bar about as big as a closet will guide you through all the choices. Insider tip: Don't miss the mulled red wine. It's a pub specialty in the winter. 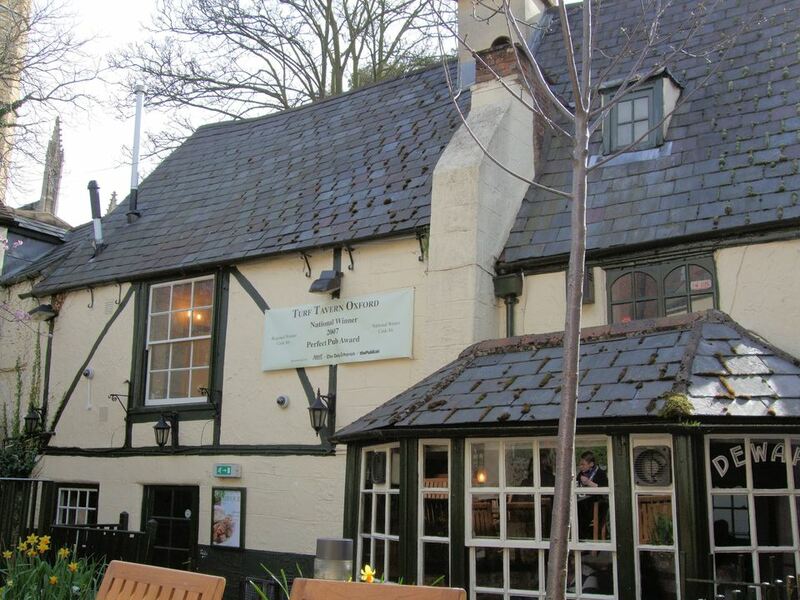 Main courses range from traditional English pub dishes like Cumberland sausages and mash, beef and ale pie, and fish and chips, to burgers and salads. Sides include great triple cooked chips. Desserts are traditional and solidly English--sticky toffee pudding, Eton Mess cheesecake, triple chocolate brownie. We like the dipping doughnuts with strawberry and apple dipping sauce. Wrapped by other buildings on all sides, the pub's three outdoor beer gardens are comfortable year round. In the Middle Ages, these courtyards were venues for cockfights and worse. The name comes from the turfmen or turf accountants (bookies) who took bets here. But that's all ancient history, today the beer gardens are kept cozy bt charcoal, in large braziers and customers are invited to toast marshmallows over them -- especially popular with kids. It's a rare pub, nowadays, that manages to be crowded with locals yet cheerful and friendly to strangers at the same time. Take the trouble to find this wonderful, atmospheric pub. Open: Every day 11a.m. to 11p.m. Food Served: Every day 11 a.m. to 9 p.m.